This was a fabulous day in the life of the synagogue goers! But, would they recognize the blessing they were now witnessing? Would they recognize who this man was standing before them? Jesus knew they would have difficulty with this statement but he pressed the issue, not to be defensive, but to help them see that their trouble was their familiarity with him. They needed to get past this hang up if they were going to hear the message he was proclaiming. To drive the point home, Jesus quotes some Old Testament examples of Elijah and Elisha. The Israelites were living in idolatry and God sent his prophet to help Naaman – a Syrian, actually, an enemy of Israel! Why? What is the point? Sometimes outsiders see and appreciate more than those who are too close to the situation. All too often familiarity breeds contempt and separates us from the blessings God intends us to have. Jesus was patiently leading his own people to recognize him as the promised Messiah. But, first they had to look at him with new eyes of faith and not be resentful of the way people in neighboring villages were praising him. Jesus has also led us to himself. Maybe it was your infant baptism for many of you. Then the Holy Spirit used a parent or grandparent, or Sunday School teacher or Christian friend who led you into a closer relationship with Jesus through the Word. These people were part of a denomination – probably Lutheran for many of you. But, why are you here today? Is it because it is Sunday and you’re good Lutherans? Is it because of the friendships you have here? Maybe you are comfortable here? Maybe you like “today’s guest” preacher? If so, let me fire a warning shot over your bow! Your sinful nature will love it if you love a church because of the externals because Satan knows that when he can destroy the externals he will easily destroy your desire to worship here. (Jim, if you want to say something about coming not because of Pastor Hering….) Even if the truth of God’s Word is being preached here, if we resent the building, the pastor, the decisions made by the Executive Committee or the people in the seats next to us, then we are no better than the people in the synagogue at Nazareth. If you’re like me, you know how easy it is to get angry and pick up your marbles and go on to leave all this church stuff to someone else. Sadly, some are even tempted to go from church to church trying to find the one at fits you until one day someone loves you enough to say, “Maybe it isn’t the church, maybe its you!” So, let’s “Get over it and let’s get Jesus!” Focus your attention on the Son of God revealed in Scripture. Let everything else be of second importance. 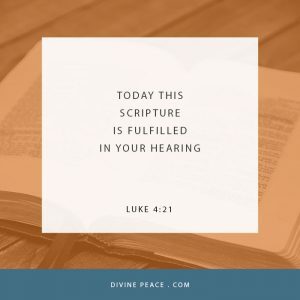 Listen to the Prophet who Connects himself to us through his Word to give us forgiveness, peace, love and hope now and someday, we will enjoy being in his presence forever! To Connect them to the Truth. Jesus brought them to a realization of the truth – but the truth ran up against their reason and raised their blood pressure of anger, not their praise of the Lord. What was Jesus’ reaction to all their anger? Well, Jesus, was Jesus. He did not try to talk them out of it. He didn’t display his power in some dramatic way like opening up the earth and swallowing them up. He simply walked through the middle of them all. Later, perhaps, they would realize for themselves why they had not been able to do away with him. It might make them all think about just who Jesus is all over again. It is our prayer that they were connected to the truth and brought around to the point of receiving the gift of eternal life through faith in Jesus. Likewise today, we all know how hard the devil works to try and disconnect us from the truth of God’s Word. We all know how hard we work to support Divine Peace, the pastors, the leadership, and the congregation. The life of the church has many difficult days. People get upset at the church, or the pastor and each other for so many reasons. The devil could use that to upset us – couldn’t he? But, compare these difficult days to what happens when we witness the baptism of a baby Brooke (Jared and Hannah’s baby) at our church? (and the baptism of Ethan Ashburn is coming up soon!) Don’t you want to bust out and thank God for allowing this place to be here so we could have a house for God’s Word and a place to use his blessed sacraments! If you’re like me, you’ve had your tough weeks, too. But, how many times have you come up to receive the Lord’s Supper and looked up to the cross and sighed a thank you to Jesus for his forgiveness and love—yes, for connecting our hearts, souls, and faith to the truth as we listen to the Prophet! Getting back to Jesus and the account at Nazareth—Can you begin to guess what was going through Jesus’ mind as he walked away from his home town and on to Capernaum? Therefore we give thanks—Jesus connects us to the truth! So, we ask ourselves about denominations. What church do you want? What kind of church do you want Divine Peace to be? I pray that we will always make our church a church where the truth of God is proclaimed. And how will we know if it is being proclaimed here or not? That means each of us needs to be in the Word ourselves, with our own eyes, reading, listening, having our souls fed directly from the source. Then we can come here and know it is for our good when the law stings our hearts and for our eternal good when the gospel sooths our souls. Do you agree with me about what church you call your church becomes very important: that is if you want one that is proclaiming to you the authoritative teaching of God’s Word. Having a church that proclaims the truth of God’s Word also calls for our prayers. Let’s pray for our pastors often, that even in the midst of trials they would faithfully lead us to the truth of God’s Word. Let’s also pray for our church leaders, as we promised we would at their installation here last Sunday, and taking place in Rockwall today, that when difficult decisions have to be made, they make them according to God’s will and with great wisdom. Then let’s pray for ourselves, that when a message comes to us that threatens our comfortable life, that the message isn’t rejected, but received with thanksgiving and faith as we rejoice in the gospel of forgiveness and restoration. “Is all this church stuff really going to make a difference in my life?” Indeed, there are many hundreds of denominations and thousands of churches out there. They all want to make a difference in your life and most promise to give you a better relationship with God. Therefore, when you talk to your friends about the different churches don’t argue about who’s right, but what’s right. You are free to go to any church you want in America. However, whether a church has all the frills, relationships, and social activities for your family or not, above all else – be sure you are in the Church that proclaims the full counsel of God wrapped in the good news of Jesus the Prophet who connects himself to you and your family through Gospel in Word and Sacrament, and connects us to the truth. For this, my dear Christian Friends, will have eternal blessings. Amen.